A bombshell report that Israeli Prime Minister Benjamin Netanyahu has threatened to attack all Iranian facilities and assets within 40 kilometers (25 miles) of Israel’s Golan Heights is circulating in Israeli media. The story first picked up by The Jerusalem Post based on Israeli and Arab sources, also indicates that intense and potentially breakthrough back channel diplomacy between Assad and Netanyahu is currently being mediated via Vladimir Putin. Though unconfirmed, what appears to be an ultimatum by Netanyahu could be the catalyst that finally pushes the Levant either toward broader war, or in the direction of de-escalation and regional stability after months of intensifying and provocative Israeli airstrikes on Syria and a corresponding war of words. The report also follows on the heels of a rare and unexpected visit of Assad to Sochi, Russia where he met with Putin just prior to trilateral talks between Russia, Iran, and Turkey over the future of Syria. The report also claims that Putin then called Netanyahu to relay the message and that the Israeli prime minister said he would be willing to accept the deal, but that Israel’s goal of eradicating Iran and Hezbollah from the country would remain. According to the source, Jerusalem sees Assad as the last president of the Alawite community, indicating that a change of regime in Syria – at least towards a government less-linked to Iran – would be favorable for Israel. Clearly, Israel remains deeply uncomfortable with the Syrian Army’s overwhelming momentum of late, especially after the liberation of Deir Ezzor and Abu Kamal from ISIS and seeks to keep the fires burning in Syria, at least enough to bog down Assad and Iran, while bringing pressure to bear designed to force an Iranian and Hezbollah exit from the theater (especially now that Israel finds itself in a weakened position regarding its desire for full-on regime change in Syria). Worse for Netanyahu, Hezbollah seems stronger than ever, along with the ‘resistance axis’ that stretches from Tehran to South Lebanon, with Israel’s worst nightmare – the so-called “Iranian land bridge“ being connected for the first time in recent history. According to a dubiously sourced BBC report from earlier this month, Syria stands accused of hosting a sizable Iranian military base south of Damascus, which Israel utilized to ratchet up the rhetoric in preparing its case for strikes on supposed Iranian targets inside Syria before the international community. Israel has long justified its attacks inside Syria by claiming to be acting against Hezbollah and Iranian targets. And as we’ve consistently highlighted, Israeli officials have gone so far as to declare their preference for Islamic State terrorists on their border rather than allies of Iran. But as we’ve also explained, Israel is acting from a position of weakness and desperation as all that Netanyahu can hope for now is that an Israeli provocation leads to a direct Syrian military response, but Assad never took the bait which could have led toward massive regional war – even after multiple Israeli provocations – and Netanyahu is now forced to negotiate via Moscow. The source also commented that after the defeat of the Islamic State, the conflict in Syria would become ”more difficult,” likely pointing towards a vacuum that would be left without the group. Russian, Syrian and Iranian-backed forces have been fighting against ISIS, while also seeking to knock out rebel groups that oppose the current regime. Russia’s stated interests have been in line with Iran’s in wanting to keep Assad in power. 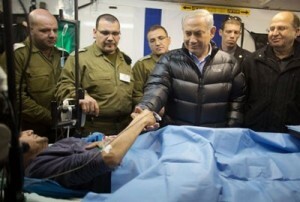 The Israeli government has been providing medical assistance to wounded “Syrian rebels” for more than a year. 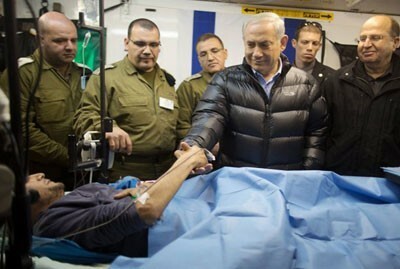 In February, Prime Minister Benjamin Netanyahu visited to a military field hospital in the Golan Heights medical facility where wounded “Syrian rebels” were being treated. He is pictured here with Defence Minister Ya’alon. It’s certainly no secret that Israel has aggressively pursued regime change in Syria for years (perhaps even decades), but recent provocations, even while Russia maintains a significant presence in the air over Syria, has created an explosive mix which could blow up at any moment. Things have been especially tense along the contested Golan Heights region as each time Israel claims it’s shelled from the Syrian territory bordering the country, the IDF retaliates for the attacks it inevitably blames on Damascus, despite the fact that terrorist groups have been controlling parts of those very bordering territories. Should reports of the Assad-Netanyahu deal be confirmed, it could actually be a positive step towards the continued winding down of the Syrian proxy war; however, it is also entirely plausible and even likely that Netanyahu will use the deal as an excuse to escalate Israeli military action in the Golan and elsewhere in Syria. After all, he can now hold out the “no Iranian facilities within 40 kilometers” as a red line up for his interpretation. And international media and Western governments have already demonstrated a penchant for towing the Israeli line anytime Iran can be blamed as a culprit – evidence or no evidence.